Unlike some ratings, SelectHub product scores are taken from multiple sources including top analysts and actual buyers of the software—ideal for your shortlist. Over 80 business analytics and BI tools evaluated. The SelectHub platform contains expert software analysis across key criteria and vendor data. These built-in analyst ratings are combined with subjective user ratings to create SelectHub ratings reports—which allow us to provide you with highly accurate recommendations and pricing. Want help with your shortlist? 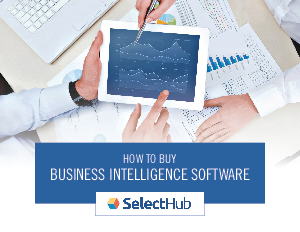 Connect with SelectHub to expedite your BI software search with free recommendations based on our expert software evaluations and feedback from actual buyers.